Okay, as many of you know, I am not really a football fan. Having said that, I will (and do) cheer for the Seattle Seahawks! Spectacular shot. You sure do live in a beautiful part of the world! The Pacific Northwest is an amazing place to live, love it here! Wow! Great shot David. 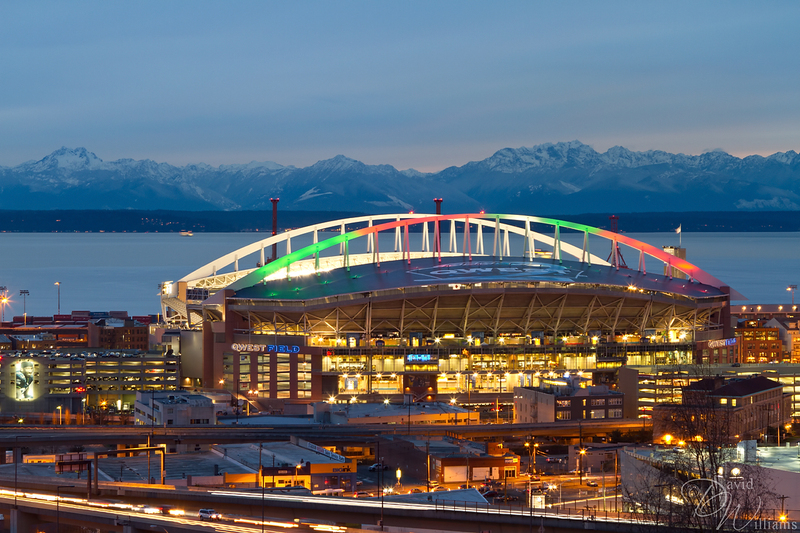 Never knew Qwest Field can look so good. 😉 This is definitely a stock photo material. Nicely done David. I like the blend of modernism and nature in this composition. Seattle is a beautiful city and will definitely plan on visiting again in the future – last time we visited there was in 2000. Oh Sasi, the Seattle area is truly amazing! So so many things to see and do here, love it! Great shot! I’m planning on taking some city scape shots of Cleveland at some point, but haven’t found a place to set up yet. Where were you for these shots, on a rooftop, shooting out a window, alongside the road? Hi Jim, if I remember correctly, I was on a hill top. Either that or on a bridge but pretty certain I was on a hill top. 😀 Can’t wait to see your city shots of Cleveland! Lovely shot! I love the long exposure! I was first captivated by the brilliantly lit foreground, then noticed the beautiful background with the mountains! Beautiful! Thank you, it certainly is scenic isn’t it? I personally really like the “touch” the mountains add. Awesome photo! I really wish I had gone down there with you that day!! I so used almost the same title as you today, oops!